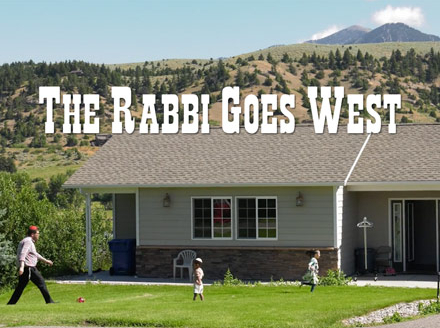 THE RABBI GOES WEST is an intimate documentary portrait of Chaim Bruk, a young and charismatic Hasidic rabbi from Crown Heights, Brooklyn, who moved to Bozeman, Montana, to bring his Orthodox Judaism to the American West. To celebrate his love for his adopted state, Chaim is on a mission to place a Mezuzah, an encased prayer offering, on the doorpost of every Montana Jew. That’s 1300 Jews in a state 14 times larger than Israel. With his Hasidic family–a wife and four adopted children–Chaim finds himself accepted, a local celebrity, in the cowboy land of “live and let live.” But he meets resistance from other Montana rabbis, Reform and Conservative. They believe that his Mezuzah campaign is a ruse to move their congregants to his Chabad synagogue, and they charge that his type of Hasidism is an evangelical cult. On this majestic western frontier, where God and Nature are so entwined, can the genuine spirituality of all three rabbis prevail over their bickering about religion and fighting over turf?